The latest stage of the project includes the addition of The Good Home Bar to the existing town square dining precinct, and a large retail and office space housing tenants such as Hells Pizza and Smarty Pants on The Runway, the main thoroughfare through The Landing. When completed the second stage will boast a 3509 square metre site area, including 1800 sqm of retail, 600 sqm of office space and 451 sqm of hospitality spread across three buildings. The precinct will be home to retail, dining, commercial and community facilities in a high street-style environment. 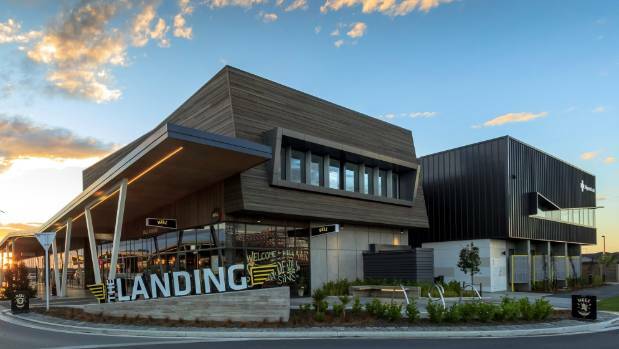 Built around a town square, The Landing will cost around $20 million and will act as a social and economic drawcard to Wigram Skies’ master planned community, south-west of Christchurch. Stage one of The Landing, which was completed in mid-2015, has a 8975 sqm site area, including 2000 sqm of retail and office space spread across three buildings and a 2600 sqm New World supermarket. The Runway’s varying roof height adds depth and elevation to the area and protects people from elements,. Parking is situated in the northern and southern precincts. The project is due for completion by 2018 when it is expected nearly 1800 homes and 4000 residents will be there.